Gamma-aminobutyric acid (GABA) is the main inhibitory neurotransmitter in the brain. The function of GABA-ergic neurotransmission is to inhibit neuronal firing. The GABAAR is a pentameric ligand-gated ion channel which consists of 5 subunits with the most common receptor formed by two α, two β, and one γ subunits. 19 genes code for these subunits, allowing for huge heterogeneity of GABAAR expression throughout the brain. Activation of GABAARs lead to a decrease in neuronal membrane potential via the influx of chloride ions, thus inhibiting the firing of an action potential. A specific GABAAR subtype that consists of the α5 subunit is focused in the hippocampus. The hippocampus is the key centre for learning and memory and is especially essential for the formation of spatial and episodic memory. In particular, the hippocampus is involved in neurodegenerative diseases that result in dementia, as well as short-term memory loss caused by anaesthetics, many of which directly activate GABAARs. Major efforts were made to target α5 GABAAR to enhance cognitive performance by blocking receptor function. Mounting evidence suggests that reducing the activity of α5 GABAAR can enhance learning and rescue memory defects in animal models. 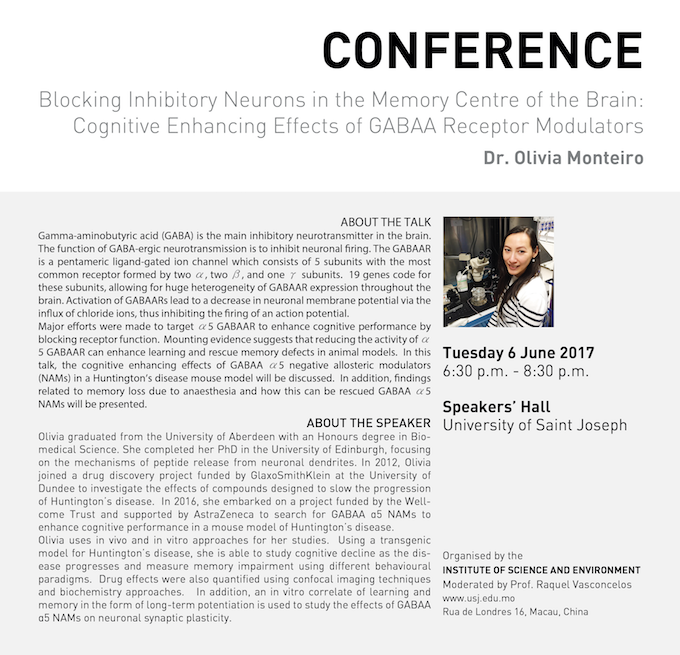 In this talk, the cognitive enhancing effects of GABAA α5 negative allosteric modulators (NAMs) in a Huntington’s disease mouse model will be discussed. In addition, findings related to memory loss due to anaesthesia and how this can be rescued GABAA α5 NAMs will be presented. Olivia graduated from the University of Aberdeen with an Honours degree in Biomedical Science. She completed her PhD in the University of Edinburgh, focusing on the mechanisms of peptide release from neuronal dendrites. In 2012, Olivia joined a drug discovery project funded by GlaxoSmithKlein at the University of Dundee to investigate the effects of compounds designed to slow the progression of Huntington’s disease. In 2016, she embarked on a project funded by the Wellcome Trust and supported by AstraZeneca to search for GABAA α5 NAMs to enhance cognitive performance in a mouse model of Huntington’s disease. Olivia uses in vivo and in vitro approaches for her studies. Using a transgenic model for Huntington’s disease, she is able to study cognitive decline as the disease progresses and measure memory impairment using different behavioural paradigms. Drug effects were also quantified using confocal imaging techniques and biochemistry approaches. In addition, an in vitro correlate of learning and memory in the form of long-term potentiation is used to study the effects of GABAA α5 NAMs on neuronal synaptic plasticity.